Although it seems like Everless got a fair amount of hype, I didn't hear much of it before picking up a copy. Its gorgeous cover caught my eye and I thought the synopsis sounded interesting, so I decided to give it a try. I'm so glad I did because this is one of the more unique fantasy books I've read recently! Jules was raised at Everless before she and her father had to flee for their lives. After spending years living in a small town, Jules returns to Everless to make enough money to support herself and her dying father. Once she gets there though, she starts to uncover secrets about herself and the Gerlings and things get twisty and amazing! I really enjoyed Jules and thought she was a fantastic heroine. Thank goodness for a MC who isn't irritating! I loved uncovering her past with her and trying to discover who was trustworthy and who was an enemy. Speaking of which, I loved pretty much every character in this book! It's amazing when I can't figure out who to trust in a story and Everless really delivered! The Gerling brothers are both fascinating characters with complicated backstories (and current stories). I was concerned about a love triangle, but that never happened, thank goodness. Actually, I really liked that the romance was kept to a minimum, although I have a hunch that it might have a bigger part to play in book two (and I can't wait). I also liked the focus given to female friendships and the care that was given to not letting them fall into any of the ridiculous tropes we're all so used to. Like I said, Everless is a pretty unique fantasy. It took me a few minutes to get my head around time being used as currency, but I thought it was pretty amazing once I got used to it. The world building and mythology surrounding this time-centric culture was really well written and I really can't wait for more magic and timey wimey stuff in the next book! I guess maybe I'm really dumb because I actually didn't guess any of the big twists! In fact, my guesses were pretty far off. Oh well, it makes for a more exciting read. Let me go ahead and say I loved Everless! There were a couple moments when I felt the story might have dragged just a bit, but after a series of books that dragged A LOT, this was a breath of fresh air. I listened to the audiobook and had a hard time putting it away, which is saying something, since podcasts have been winning for the last few months. 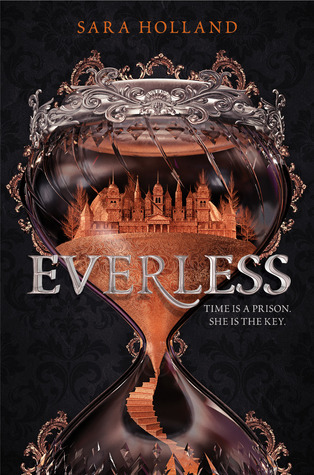 I definitely recommend Everless for fantasy fans and I absolutely can't wait for Evermore!